Park Rapids: A MN GreenStep City? Name: Park Rapids: A MN GreenStep City? To learn more, come to the free program Thursday, April 19, 6 pm at Northwoods Bank in Park Rapids. 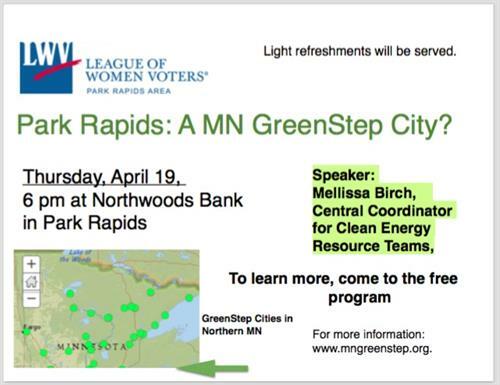 Sponsored by the League of Women Voters of the Park Rapids Area, Mellissa Birch, Central Coordinator for Clean Energy Resource Teams, will be the featured speaker. Light refreshments will be served.